Size: Adults remain small, less than 7 inches long from tip of nose to tip of tail. Color: House mice are gray or brown and have hairless, scaly tails and ears that are relatively bald. Habits: The house mouse is curious and tends to investigate new objects placed in its environment. House mice and their droppings are known carriers of disease including mites, typhus (fleas), salmonella, tapeworm, roundworm and others parasites. 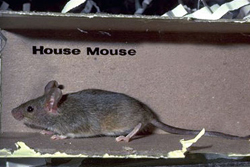 The house mouse is considered to be one of the most troublesome and economically important pests in the United States. Their relentless gnawing causes damage to both structures and property. Diet: The house mouse often consumes food meant for humans or pets and favors grains, dried fruits, nuts and sweet materials. Reproduction: A prolific breeder, the house mouse is sexually mature at two months old, has a gestation period of only three weeks, and averages five to eight young per litter. Each female may give birth to eight litters. The house mouse can live from two to three years. Other Information: House mice are active wherever droppings, fresh gnawing and tracks are noticed. Their nests are made from shredded paper or other material and are often found in sheltered locations. House mice have an unpleasant, musky odor that identifies their presence. They are excellent climbers and can scale any rough vertical surface. They will also run horizontally along wire cables or ropes and can jump up 13 inches from the floor onto a flat surface. House mice can slip through a crack as small as 1/4 inch wide. Size: Adult Norway rats are large and robust, reaching up to 16 inches from nose to tip of tail. Color: Norway rats are stocky and their tail length is less than their body length. Their tails are scaly and almost hairless. They range in color from white to brown to mottled, or blackish gray, reddish brown, and other variations. They have a blunt nose, small eyes, and small ears. Habits: The Norway rat is primarily a ground dweller and prefers to live in burrows. It swims very well and often lives in sewers and other underground water systems. It can be found anywhere humans live. In suburban areas they live in and around residences, in cellars, warehouses, stores, slaughterhouses and docks. Although they can climb, Norway rats tend to inhabit the lower floors of multi-story buildings. This rat is primarily a nocturnal animal, and will usually only travel 20 to 30 feet from its home to find food and water. A normal life expectancy for this rat is one year or less. Diet: Norway Rats are omnivores and opportunistic feeders, feeding on any natural or human foods available. 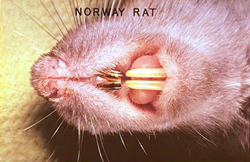 Reproduction: Norway rat litters average eight to nine pups, and a female may have several litters in her one year of life. Other Information: The Norway rat is neophobic; avoiding new objects placed in its environment for some time. Damage from gnawing can be extensive, as they chew on plastic or metal pipes, wires, wood, furnishings and walls, and they often bite humans. While not the primary reservoir of bubonic plague, Norway rats have the potential to spread this disease and several others. 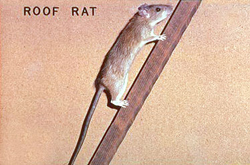 Size: Adult roof rats reach 12 inches in length from nose to tip of tail. Color: The roof rat can range in color from light brown to dark gray to black with a lighter grey belly. Its tail is noticeably longer than its body length. It has a pointed nose, large eyes, and large ears. 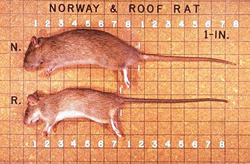 Habits: The roof rat is smaller and slimmer than the Norway rat, and cannot compete with the Norway when space is limited. Roof rats are nocturnal and secretive, staying out of view by hiding in the foliage from landscaped environments. A normal life expectancy for them is one year or less. Roof rat fleas can transmit disease such as the plague. Roof rats enter structures in search of food and are extremely destructive to stored food products, crops, pipes, and electrical wires. They are excellent climbers and often gain entry into homes through holes around cabling vents. Their climbing skills allow them to easily climb onto homes to wander from rooftop to rooftop. Diet: Roof rats feed heavily on the fruits, nuts, vegetables, or garden snails found in suburban landscaped areas. Reproduction: A female roof rat will have three to four litters in her year one year of life with an average of eight to nine pups per litter. Other Information: Roof rats are much more aerial than Norway rats in their habitat selection and often live in trees or on vine covered fences. Roof rats can enter through any opening wider than one inch, they are excellent swimmers, can climb any rough surface, and can jump vertically about three feet. Spiders had taken over our outdoor living space. PBK has done a great job of getting rid of our pests and giving us back our yard. We highly recommend them. Call us at 806.584.4091 or fill in the form below to schedule your evaluation.